The firefighters infrared camera spares not only time while searching for persons, but also allows the task force a safe operation in areas with smoke. Our firefighters infrared camera is ready for operation within lesser than 20 seconds, and can operate for more than two hours per battery in continuous operation. The high resolution uncooled FPA detector of the firefighters infrared camera convinces due to a high refresh rate of 50 Hz and a large measuring range. 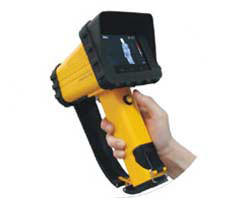 The firefighters infrared camera offers a measuring accuracy of max. ±2 °C or ±2 % within a temperature range of -20 °C to +600 °C and a sensitivity of 0.1 °C. Whether it is intense smoke or darkness – the firefighters camera guarantees an optimized view in any surrounding and as a reliable device to find missing persons or other heat sources (fire pockets). The dust- and waterproof (IP 67) firefighter infrared camera is equipped with a 3.5’’ LC-display as well as the option of choosing between different colour pallets. The clear arrangement of the control elements of the firefighters infrared camera allows an easy and intuitive handling even with heavy protection cloves on. 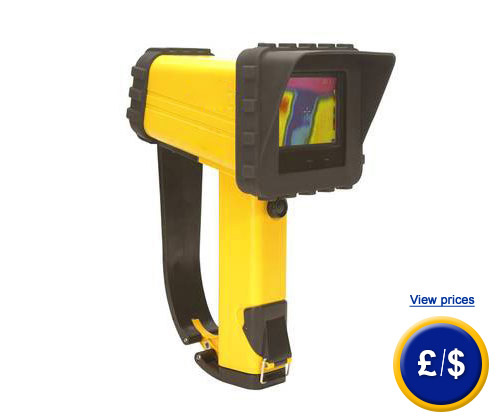 This compact and light firefighters infrared camera can even be easily applied for longer time durations under any condition. Impact resistant rubber buffers protect the firefighters infrared camera additionally even in case of a fall from 1.8 meter height. The firefighters infrared camera is safely embedded in a protection enclosure according to fire protection standards UL94-V0 with IP 67 classification. Thus our firefighters infrared camera is customized especially for fire brigade operations. For further information about the firefighters infrared camera F2-T, please read the following technical data or call our Hotline: UK customers +44(0) 23 809 870 30 / US customers +1-410-387-7703. You can also reach us through our contact form. Our engineers and technicians will gladly advise you regarding the firefighters infrared camera F2-T or any product in in the terms of regulation and control, scales and balances of PCE Instruments.